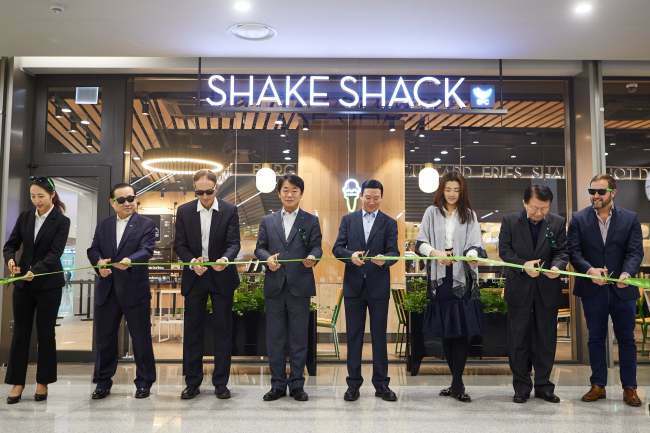 The sixth Shake Shack store in Korea has opened at Incheon Airport’s new terminal. It is the largest among five other branches of the burger chain at airports worldwide. Shake Shack stores in Korea are operated exclusively by SPC Group. The new branch is located on the first basement level of Incheon Airport’s Terminal 2, slated to open Thursday. It will offer a variety of new items including Egg N’ Cheese, Shack Blended Coffee and a dessert called Fly Me to the Shack. Officials who attended the store’s opening event included (from third from left) Robert Dunn, senior commercial officer at the US Embassy; Lim Nam-soo, executive director of the aviation marketing group of Incheon Airport; Vice President of SPC Group Hur Hee-soo; Executive Director of Korean Air Emily Cho; Paris Croissant CEO Choi Seok-won; and Sean Wagner, director of international operations at Shake Shack.